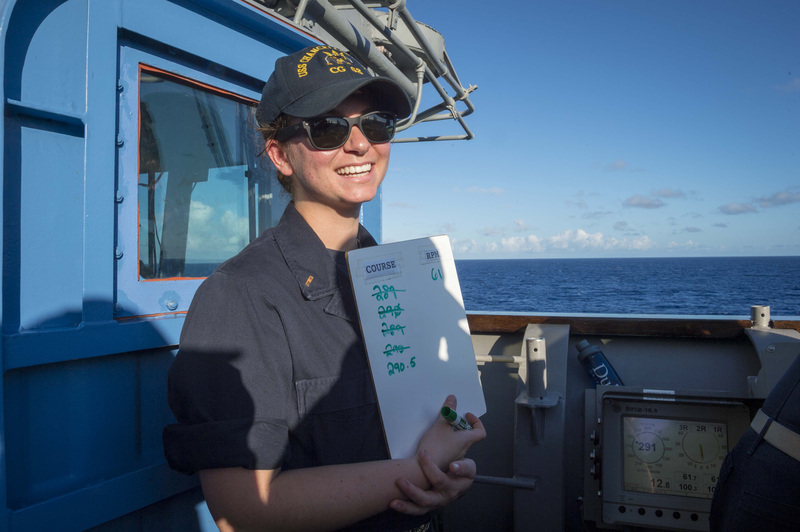 Ensign Julianne Dahlman, a Bishop England High School graduate and former Daniel Island resident, is spending time in the Phillipine Sea this summer as part of her U.S. Navy service. In this photo, Dahlman is shown logging the course and rotations on the starboard bridge wing aboard the Ticonderoga-class guided-missile cruiser USS Chancellorsville (CG 62) during a multi-ship replenishment-at-sea with the Henry J. Kaiser-class underway replenishment oiler USNS Rappahannock (T-AO 204) and the Akizuki-class JS Fuyuzuki (DD 118). Chancellorsville is forward-deployed to the U.S. 7th Fleet area of operations in support of security and stability in the Indo-Pacific region. Dahlman is a 2018 graduate of Duke University.